The digitally remastered compilation of the 1927 & 1928 Bristol Sessions includes previously unreleased material and is the first time both the '27 and '28 Sessions have been packaged together. Copies of the Bristol Sessions Box Set are currently in transit to the offices of The Birthplace of Country Music Alliance. If you are interested in ordering a copy, call the BCMA and reserve yours for $180. 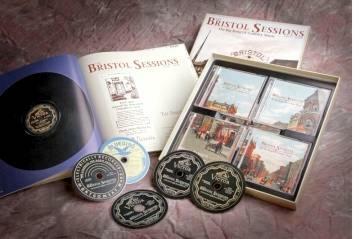 The box sets include the complete recordings of the 1927 and, for the first time ever, the complete 1928 Bristol Sessions. This 5 disc set also includes a 120 page book detailing the sessions, artist, and a brief history of country music. Also included in the book are the full lyrics to all the songs recorded in the Bristol Sessions. ', 'The Bristol Sessions 1927-1928, a 5-CD boxed set accompanied by a 120-page coffee table size hardcover book, will be released March 01, 2011 on Bear Family Records. Johnny Cash once called the Bistol sessions "the single most important event in the history of country music." Call 276.645.0111 or contact the Birthplace of Country Music Alliance for more information.